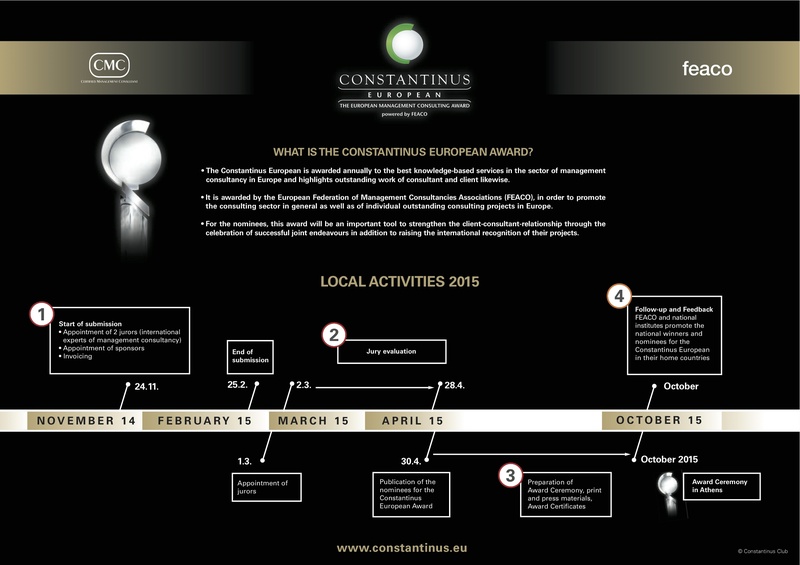 FEACO has launched the 2015 edition of the Constantinus European Award. The annual international prize recognizes outstanding management consulting projects and showcases excellence in the field. Following the participation of many national institutes last year, FEACO encourages applications demonstrating the accomplishments of the branch and inspiring future partnerships. Projects can be submitted until February 25th 2015. The jury will be composed out of international experts in the field of management consultancy as well as of prominent representatives of successful businesses. After Madrid last year, the 2015 award ceremony will take place in Athens next October. Feaco looks forward to celebrating the achievements of the management consulting industry in delivering high quality knowledge services to businesses and entrepreneurs.